and the AJK government to highlight the lingering dispute on world forums. Addressing the gathering at the Pakistan Embassy, the President shared with them the latest surge in the Indian-held Kashmir after the death of Kashmiri young freedom fighter Burhan Wani in July, who was hugely popular among Kashmiris in the Occupied valley. He emphasized that the martyrdom of Wani has infused new vigour in the indigenous freedom struggle of innocent Kashmiris who have been fighting for their right of self-determination for almost seven decades. were seriously injured because of the indiscriminate firing by occupying Indian forces. Commenting on the Indian claims that pellet guns were non-lethal, he remarked that the Doctors Association in Kashmir had clearly said that the embedded pellets in the bodies of the victims were causing fatal lead poisoning and put pregnant women at serious risk. 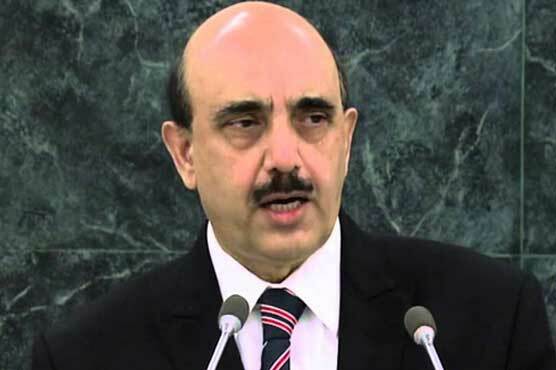 President Azad Kashmir added that the Kashmiris in IOK were under siege in their own land. Peaceful demonstrations were a crime, political meetings were banned and true representatives of Kashmiri people had been incarcerated. Sardar Masood Khan briefed the Pakistani and Kashmiri diaspora on the steps taken by his Government towards good governance in Azad Kashmir. He commended the bold and unambiguous stance taken by Prime Minister Muhammad Nawaz Sharif on the Kashmir issue during his address to the UN General Assembly. The President concluded with remarks that situation in disputed Kashmir requires immediate attention of international community and emphasized a sense of urgency to take action since it is not business as usual. Earlier, speaking on the occasion, Ambassador Jalil Abbas Jilani said that Prime Minister’s historic speech in UNGA was forceful and effective to bring the issue of Kashmir in UNGA. This issue was never raised at UNGA so vigorously that created tremors in the ranks of Indian government and media. During his New York visit PM had meetings with 48 Head of States and Governments, UN Secretary General and Secretary of State John Kerry and presented Kashmiris case their plight, misery and unprecedented state terrorism of India.